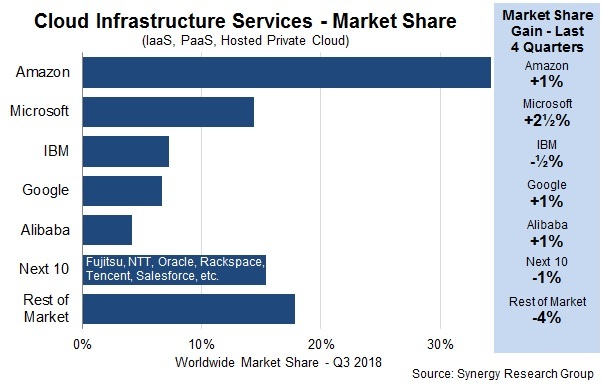 Amazon Web Services is continuing its dominance in the cloud infrastructure services with 34% of global market share in Q3 2018, according to Synergy Research Group. No. 2 Microsoft followed with 14%, Google and IBM tied with 7% each and Alibaba followed at fifth with 4%. The Q3 growth rate was down slightly relative to Q1 and Q2, but year-over-year it has jumped 45% for the quarter, according to SRG. Strengthening of the U.S. dollar reduced reporting growth in some foreign markets calculated in U.S. dollars, according to John Dinsdale, chief analyst at SRG. For another quarter running, Microsoft, Google and Alibaba blew past the market growth rate, with Microsoft especially gaining ground, adding 2.5% in market share over the last year. Quarterly cloud infrastructure revenue has surpassed $17 billion, including infrastructure as a service, platform as a service and hosted private cloud services, according to the report. IaaS and PaaS grew 51% on the quarter. Dominance in the market by AWS, Microsoft and Google creates a difficult arena for smaller cloud players to keep pace, pushing them into specific regions and market niches, wrote Dinsdale in the report. But these small and mid-sized operators are still seeing "reasonable revenue growth," even if they lack the scale and finances of the biggest market leaders. Amazon continues to hold more global market share than the next four biggest competitors combined. High growth rates for Microsoft, Google and Alibaba are not out of the ordinary for a business operating on a smaller scale of business; but as the scale of business and market lead grows, rates will start to decline. With its cloud spend growing 50% annually in platforms and 30% in SaaS, Microsoft is bullish on its prospects for raking in the $2.5 trillion in IT spend on the line. The company is betting that it's trust factor, hybrid capabilities and business model will continue building credibility in the cloud infrastructure market.